Motherboard makers pull out all the stops when trying to lure enthusiasts. Overclocking features are a given, but many high-end boards boast fancy LED lighting and various bits of eye candy, such as Biostar's racing-themed mobos. Asus is taking a different approach with its X99-E-10G WS, a top shelf workstation slab that it says is for professionals and gamers alike. "In an industry full of ostentatious claims, every product stack needs a reserved, understated statesman. Not the type that stays quiet in board meetings out of fear, nor the type that needs to raise their voice to make a point. Nope, we’re talking about the type that sits back and observes the young upstarts as they clamber over each other to get into the limelight and then makes one careful, reassuring statement in a deep, soothing voice that stops everyone in their tracks," says Rajinder Gill, Technical PR Manager at Asus. The X99-E-10G WS might be understated in terms of bling, but as for the hardware and overall features, it's all about excess. It starts with dual 10 Gigabit Ethernet ports that come courtesy of Intel's X550AT2 10GBASE-T controller. Each of the two ports offers ten times the bandwidth of a standard Gigabit Ethernet port. This is purportedly the first workstation board to sport Intel's X550AT2 10GBASE-T controller. Implementing it on a feature-packed board took a bit of careful planning. That's because the Intel chip consumes 11 watts of power, so Asus had to be careful with how it handled the associated thermal output. And on top of that, short signal lines are needed to get the best performance from the X550AT2. With those things in mind, Asus plopped the controller near the rear Ethernet ports and used a heatsink array to dissipate heat through the rear I/O panel. One of the benefits of having two onboard 10 GbE LAN ports is that anyone who can take advantage of them won't have to fill up a PCI Express slot with a dedicated network card. That's not to say PCI-E slots are in short supply here—this board has seven of them, all physically x16 in length, though if you populate all the slots they'll run as x16/x8/x8/x8/x8/x8/x8 (all as Gen3 slots). It also has 10 SATA 6Gbps ports, a full-bandwidth x4 Gen3 M.2 slot that's strategically placed away from typical motherboard hotspots, and a U.2 port that replaces the SATA Express port found on the old X99-E-WS. These features along with audio need additional PCIe lanes. The board gets all of these lanes from two PLX PEX-8747 chips, each of which takes 16 lanes from the CPU and splits that into 32 lanes. That gives the board a total of 72 PCIe Gen3 lanes, with items like USB running off the X99 PCH (the M.2 and U.2 share four lanes). 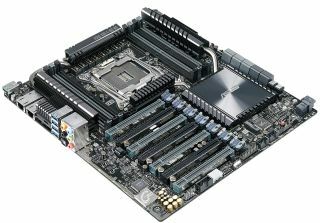 Other features include eight DDR4-3333 DIMM slots, four USB 3.0 ports, two USB 3.1 ports (Type A and Type C), a TPM header, extra pins on the socket for added stability (especially when overclocking), and shielded onboard audio. Excess comes with a steep price—in this case, it's $650. That may seem especially high, but dual-port 10G Ethernet adapters can run $200 or more, so if you're running 10G it's actually not too bad. The board will be available soon.